The Gas Finder app and others don't enjoy the updating like the fuel apps do. 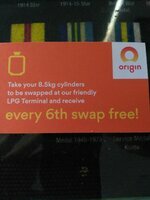 Yesterday I got my bottles refilled in Maryborough QLD at the Origin Depot, $17 for an 8.5kg and thats refill or swap, they also have a loyalty card with every 6th bottle free. I think it applies at the Gympie Origin Depot so may also be available at others, might pay to check depots next time you pass one. Any other places that have good prices ??????? Anaconda still has it's 9kg bottle refills for $19.95, for members and joining is pretty painless...........................cheaper than Bunnings but you may find BCF with similar refill prices. If you check the gasbottles refill site and follow the directions, you can get gas refills at Anaconda for $15. Great thanks. I had not heard about this website but will log it now. Thats right !!!!! and I had forgotten about it ............................ rarely get to an anaconda except for Canberra and Toowoomba. Just had BCF in Darwin fill my 3.7kg for $8.00, cant go wrong. Absolutely correct Mike @mikerezny . Just got one of my 9kg bottles filled at Anaconda for $15.00 and you do not even have to be a Club member. However, you must produce the correct bar code which they scan so you can get the refill at that price. The full details are on the web site Mike has listed above. I just printed out the whole 3 pages and placed them in a plastic envelope and have it attached to next bottle to be filled. Smart people can even record the bar code on their phones as per the web site. Normal price at Anaconda is $19.95 so worth the saving if close by. Cheapest rate that I know of in Brisbane area. Bunnings "swap and go" is $27.50 I think, and garages here are dearer still. The Anaconda Gas Refill code is 9341235325874 , if you have an app like Stocard for your loyalty cards on your phone just put the number and its there to be scanned ........saves hassle...the website states available at 41 stores, last check there are 50 in the country so should be lucky......if away from the coast they are rare. My understanding was that you only got another 4c off if you spend $5 or more instore. Has that changed recently? Some Anaconda stores are not located in a premises where they can legally refill gas cylinders. For instance, the Anaconda down the road from us is just a store in a shopping complex. Exactly but you would be some sort of nutter if you wandered thru a shopping centre with a gas bottle, the one at Tuggeronong comes to mind then again there are some strange people loose on this planet. My apologies, you are indeed correct! If you spend $20 in store you get an extra 10c off per litre. It has been a long time since I bought fuel from Coles. They seem to always be much more expensive than other servos, especially Caltex / Woolworths. Plus their Flybuys Fuel specials seem to only apply to petrol not diesel so give them a miss . Which is what I always understood. The shopper docket applies to petrol and diesel but the additional/ occasional flyby discounts are usually only for petrol. Ie to be used in addition to the Coles 4c deal.